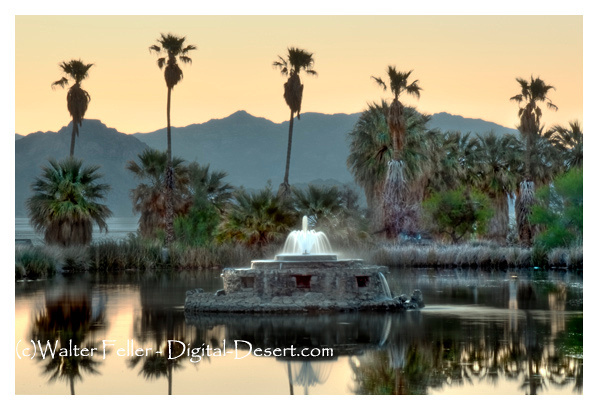 Lake Tuendae, Desert Studies Center, Zzyzx, Ca. Near the mouth of the Mojave River, where the intermittant waters seep into Soda Lake, a mineral spring wells up near a basalt outcropping. 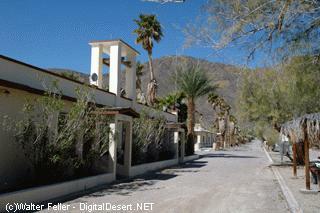 Father Francisco Garces passed through this place, Soda Springs in his journey through the Mojave desert. 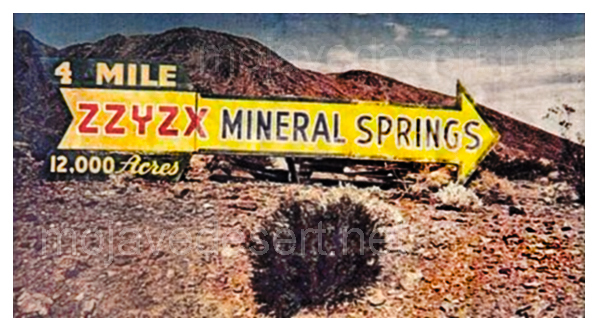 Over 50 years later, Jedediah Smith passed south of the springs up into Afton Canyon (he instructed his Mohave indian guide to take him the most direct route) on his excursion. In the 1860s, the US Army used this spot as the location of Fort Soda Springs. 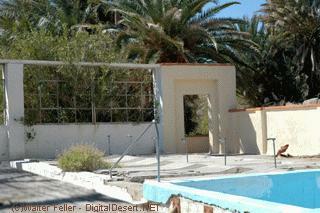 In the mid-1940s, at this western end of the vast Soda dry lake, the charismatic quack, Curtis 'Doc' Springer built a health resort. 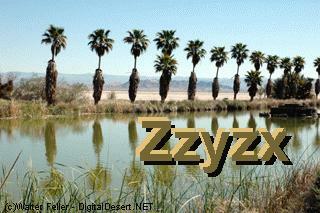 He named the resort Zzyzx. It was designed to be the final word in the English language -- Also, the cure to end all cures. He promoted it wildly on his quasi-religious Los Angeles based radio show. He sold his celery and carrot juice tonics, herb tea concoctions and bread all over the world. He claimed his mineral springs spa and special diet could cure everything from hair loss to cancer. He wouldn't charge to stay at the resort, but he urged all to send donations. He attracted much attention and built up a thriving business that lasted over 30 years. The American Medical Association gave Springer the dubious title of "King of Quacks". The government discovered he built the spa on land he didn't own. In 1974 he was evicted, arrested for food and drug law violations and spent several months in jail. 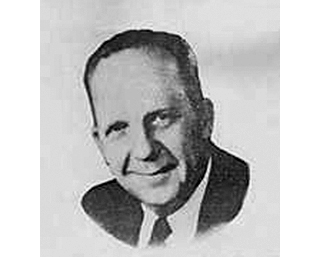 He retired to Las Vegas and died in 1986.